Jamon is the result of curing (salting and drying) the hind leg of a pig. Jamon Serrano means "ham from the sierra ", referring to the mountainous areas that are the best places for curing jamones. The product is known as a "paleta" (shoulder ham) when it is made with the foreleg. The jamón serrano designation has been protected as a Traditional Speciality Guaranteed (TSG) since 1999 under the European Union Regulation 509/2006. Jamones are the hind legs of pigs. They include the hip, femur, patella, tibia, fibula, tarsal bones and, optionally, metatarsals and phalanges, and the muscle and fat surrounding them. The entire curing process, from slaughter to drying, takes place according to current European Union legislation (Directives 64/433/CEE and 77/99/CEE). The most commonly used breeds are Duroc, Pietrain, Landrace and Large White, fed a diet of compound feeds made mostly of cereals. The pigs do not necessarily have to be of Spanish origin; the jamón serrano TSG is a EU regulation that covers only the processing method. 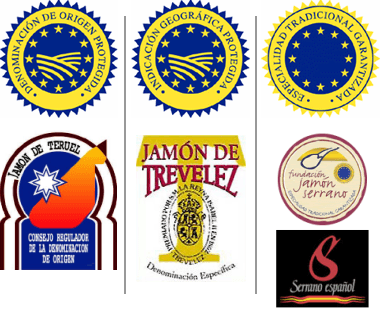 Left to right: official identification of the Protected Designation of Origin and logo of the Jamón de Teruel Regulatory Board; official identification of the Protected Geographical Indication and logo of the Jamón de Trevélez Regulatory Board; identification of the Traditional Speciality Guaranteed and logos of the two main producers' associations (Fundación Jamón Serrano and Consorcio del Jamón Serrano Español). Although all types of Spanish jamones are known internationally as "Jamon Serrano", in Spain the term is usually used for jamones from pigs not belonging to the Iberian breed (typically white pigs). Serrano jamon is also popularly known as "country ham" (jamón del país), "local ham" (jamón local), or "cured ham" (jamón curado). The climate conditions in some parts of Spain facilitate long curing times without using much salt. Jamon de Teruel: Jamones bearing the Protected Designation of Origin indicating they are made in Teruel, a cold, dry area in the south of the Aragon region. The pigs are crossbreeds of Landrace and Duroc. The latter is similar to the Iberian breed in its thin fatty streaks in the lean meat, which help keep the jamon from drying out too much with lengthy curing (between 14 and 20 months). The aging facilities in Teruel are located over 800 meters above sea level. Jamon de Trevélez: Jamones with a Protected Geographical Indication made in Sierra Nevada around the town of Trevélez in Granada province (region of Andalusia). 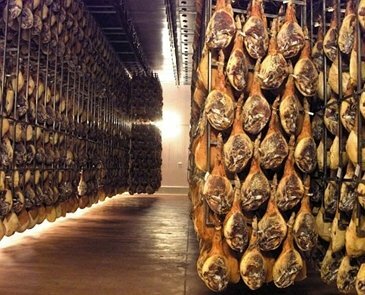 Jamones are dried for 18 to 24 months in drying facilities at altitudes between 1200 and 1900 meters. Jamon Serrano: Jamones not belonging to the above designations either because they are not made in those places or because they do not meet other requirements. The longer the drying time, the higher the grade, because aging imparts stronger, richer aromas. After the pig is butchered and the jamones removed, the temperature inside each piece is brought down to 3º C, and any blood remaining in the vessels is drawn off using a pressure process. The jamones are rubbed with nitrifying salts and then covered with sea salt to remove the moisture and preserve them. The salting time depends on the weight, fat content and shape of the jamon and ranges from 0.65 to 2 days per kilogram of jamon weight. The temperature is kept between 0 and 4º C and relative humidity between 75 and 95% throughout this time. Before salting, the week and year of salting are fire-stamped on the rind. The salt residue on the jamon's surface is removed using brushes. The salt must be eliminated from the outside so the jamon will not be too salty and to ensure that it will not inhibit the growth of bacterial flora. 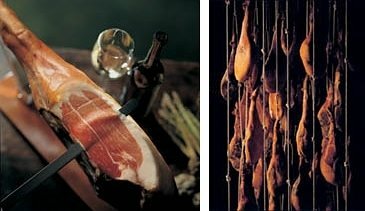 Once the jamon is left without the protection of the salt it is subject to bacterial contamination, environmental agents and parasites and may spoil. This is why it is so important to keep the facilities spotlessly clean and maintain a very low temperature. At this stage the jamon is still tender and occasionally it is reshaped to make it look more attractive. During this stage the salt spreads uniformly throughout the inside of the jamon, inhibiting undesired microbial growth and channeling the biochemical processes of hydrolysis (lipolysis and proteolysis) that give the jamones their characteristic aroma and taste. Over a period of 30 to 60 days the water content gradually diminishes and the jamones acquire greater external consistency. The temperature is kept low (between 0º and 6º C) and the relative humidity high (between 70% and 95%). While the jamones are drying the temperature is raised gradually from 6º to 34º C and the relative humidity is lowered to between 60% and 80%. This favors slow drying of the jamones, sweating (natural diffusion of part of the fat from the adipose tissues) and the emergence of aromas caused by alterations in proteins and fats. The jamones spend at least four months in this stage. During this period, which lasts from 6 to 18 months, the biochemical processes initiated earlier continue, with the intervention of the microbial flora that gives the jamones their particular aroma and taste. Every Jamon Serrano is cured for more than seven months. When the jamones come out of the aging room they have lost at least 33% of their initial weight and can be stored at ambient temperature until they are eaten, without needing to be smoked or coated with paprika or other spices. 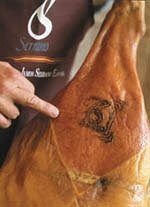 A whole Serrano jamon has no expiry date, although it is best to eat it within six months after it comes from the aging room. Jamon with a V-shaped cut. The skin is removed from the lower part of the jamon by cutting in a V shape, which is also known as the Serrano cut. The characteristic color of the slices ranges from rosy to purplish red in the lean part. The meat is smooth and tender with a delicate, very slightly salty taste. The maximum water content is 60% (in Iberian jamones it is above 50-55%) and the maximum sodium chloride content is 15% (in Iberian jamones it is 5%). Jamon Serrano is therefore less dry and more salty than Iberian jamon. The fat is glossy, white or yellowish and aromatic, with a pleasing taste. It is found on the outside edge of the slice, except in jamones from Duroc pigs, which have thin streaks of marbling fat in the flesh. More information on the nutritional properties of jamon.